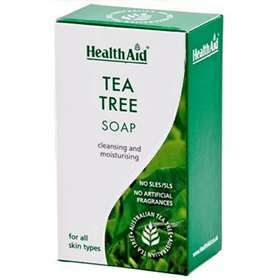 With antibacterial and antifungal properties, HealthAid Tea Tree soap is suitable for all skin types and may be beneficial for people who have dry skin or itchy skin that may be caused by allergies. Made with Australian Tea Tree. Suitable for use on hands, face and hair. Suitable for use on hands, body and face wet the soap bar and form a lather, massage onto appropriate area. Avoid contact with eyes, if contact occurs rinse thoroughly with clean warm water. Aqua, Sodium Palmate, Sodium Palm Kernelate, Melaleuca altenafolia(Tea Tree) Leaf Oil, Sodium Chloride, CI77891, CI77492, Tetrasodium EDTA, Tetrasodium Editronate CI77891, CI77492.